I've found it harder and harder to keep up with this blog because one, I'm trying to go cold turkey on buying typers. The good thing is I have no car in NYC so I no longer can go on weekend (or weekday, for that matter) adventures for typewriters. And avoiding Ebay for now. When the addiction isn't in the forefront, I forget about the blog unless I spot one in the wild. I've also had to refrain from reading the typosphere too much at one time, fearing it may inflame the addiction which is currently in remission (but damn, it's gonna be a lot of catch up!). However, I do want to try to commit to writing some thing at least weekly here if not only for discipline's sake. I was going to typecast but realized my scanner isn't working properly, perhaps damaged from the move. But luckily, I scanned a bunch before my move cross country, knowing I would need to put most of my collection in storage. I was only able to bring a handful of typers which is quite ridiculous for a regular person. They were all in boxes until recently. The weather got cold enough that I had to unpack my winter clothes and I found two in the box. One I remember packing, the other, I completely forgot about. It was a nice surprise. Kinda felt like Christmas morning! 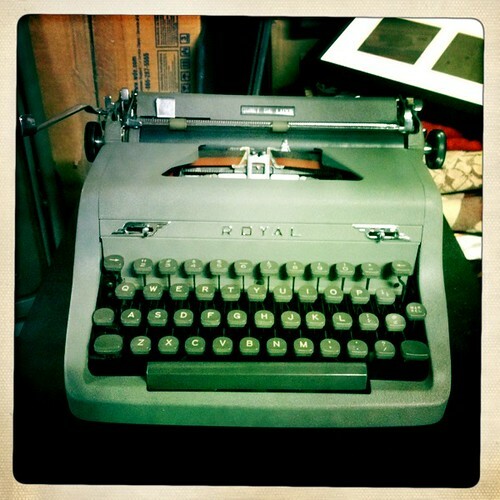 It was my grey Royal Quiet Deluxe. I've been typing on it all week. Got some decent writing done on it. I do love this clacker model. I don't have an emotion attachment to this one like I did with Rusty, but it's growing on me. It doesn't type great, but it works fine. I didn't clean it at all and stuff is falling onto my desk the more I use it. I've decided to leave the other ones in boxes still and perhaps surprise myself at later dates. Congratulations on your move and the QDL. The QDL looks like a nice typewriter. It's fun gathering typewriters. I find myself constantly wanting more, but strictly avoiding increasing the collection for now. There is still typecasting and if your scanner died and you have a digital camera -- all is not lost. Good luck with the scanner. But naturally, I would LOVE a red one.